Ever wondered about all the brightly colored walls on and around the New Ave? Learn about our New Ave murals! Starting in 2013, locations along The New Ave feature colorful posters showcasing poems in English, Spanish and French that reflect the diversity of world poetry. The poems are part of the annual Spring for Poetry program, coordinated by the Friends of the Takoma Park Maryland Library. Posters and frames are designed by graphic arts students at Montgomery College. To view poems and locations click here. Seen the new signs for Sligo Creek, at the gateways to the City, and busines directories? 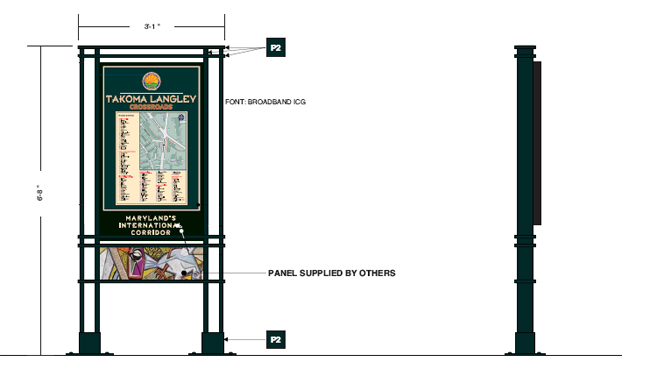 The City has contracted with local artists James Colwell and Alison Baker to provide an art panel below each sign. Their concept - to complement the flavor and history of the area - is based on vintage fruit box panels. View slide show on the finished signs.